Latest Zombies, Run! Android update adds Race Missions – Zombies, Run! We’ve just updated the Android version of Zombies, Run! to include Race Missions! 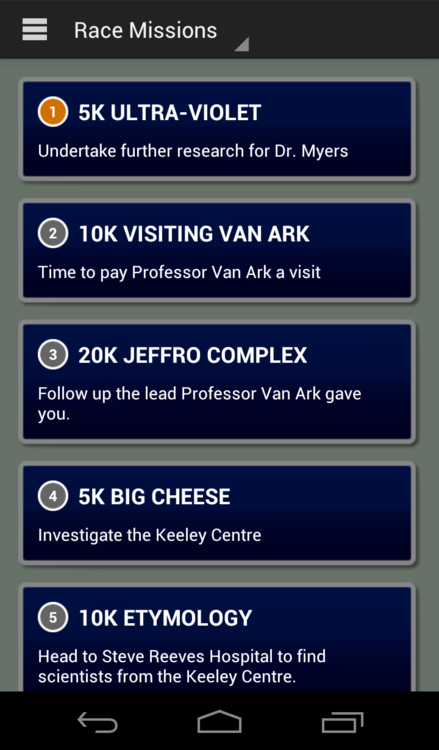 These six missions take place towards the end of Season 1 and provide more background towards the story about New Canton and Van Ark. The first three Race Missions (a 5k, 10k and 20k mission) are free, while the second batch of three (another 5k, 10k and 20k mission) are just $1.99 for the pack. These missions work a little differently from classic Zombies, Run! missions. They’re distance based, so story clips will only play once you’ve travelled a set distance. For accelerometer users, we have included a couple of options for us to estimate your distance, even on a treadmill, so you won’t be left out. We have also added the ability to build add-ons in your base. This will let you upgrade your buildings by building specific new items, giving you a one-time increase in base stats. There will be more news coming soon about updates to Zombies, Run! and ZombieLink, so keep an eye out for that. And don’t forget to join us tomorrow for our live Q&A with the Zombies, Run! writers!